MANILA, Philippines â€“ The Philippinesâ€™ sole bet in the 2014 Winter Olympics put the country on the figure skating map after making it to the medal round of the menâ€™s figure skating event late Thursday. Michael Christian Martinez, 17, made the most of the unique opportunity as he scored 64.81 in the qualifying round, which is enough for a ticket to the round of 24. The meek-looking Martinez wowed the crowd as he stepped on the ice and performed to Arthur Fiedlerâ€™s "Romeo and Juliet" at the Iceberg Skating Palace. The routine took a total of two minutes and 50 seconds. He performed fifth in a pool of 30 skaters in the qualifier, drawing applause from the crowd afterwards. Martinez, who will go down as the first Filipino and Southeast Asian skater to see action at the Winter Olympic, now seeks to sustain the momentum in the medal round scheduled at around 11pm Friday. and all he aimed for was to get into this first round of 24. whew! i'm rooting for him, what else. great guy, great spirit. ay do nat bilib yu. siyaro na man gyod pod, gawas kun ikaw ang iyahang coach. of course, he's had his falls. luckily these were during practice. one thing with figure skaters (as with ballet dancers, great violinists, etc.) is that if ever they make it look like it's the easiest thing to do, it's because they've spent grueling hours practicing. they sacrifice a lot. and that alone is already something. Peks man. Nakalusong ko that time kay nahutdan kog supply sa sardinas. Gikapoy kog tujok-tujok sa MOA kay nagkasaagsaag ko mao nga didto lang ko gaapong sa skating rink samtang gahuwat sa ahong tourist guide. hadlok ra pod nang nakalusong kah. ano ba yan? tinagalog sa moa skating rink? No less than Manuel V. Pangilinan expressed his support for Filipino figure skater Michael Christian Martinez who made his historic debut in the 2014 Sochi Winter Olympics on Thursday night. â€œWhat a brave kid, gave it all tonight. Thank you to him and his parents. Letâ€™s continue supporting him,â€ said the telecommunications mogul, who supported Martinezâ€™ journey to the Games through his MVP Sports Foundation. MVPSF executive director Chot Reyes shared the contents of Pangilinanâ€™s message on Twitter. Skating to Romeo and Juliet by Arthur Fiedler, Martinez scored 64.81 in his routine in the short program. That was enough to push him into the top 24 of the field, qualifying him to skate in the free program on Friday. 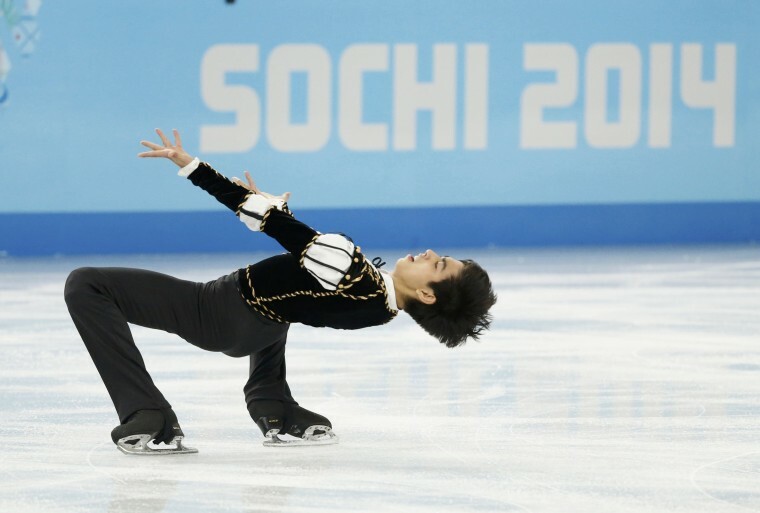 Martinez is the first Filipino figure skater to compete in the Olympic Games.